Although this feature specifically references Tri-5 Chevy parts, it will be of interest to owners and fans of all classic Chevrolets, including El Caminos. All of our older Chevys utilized pot metal and the chroming process in the manufacture of emblems, bezels and other trim items. This is how it’s done. 1956 Taillight tooling, molds for die cast parts. GM made a lot of die cast parts for our classic Chevys. Often referred to as pot metal, the parts were actually die cast zinc. Making the millions of 1955, ’56 and ’57 Chevrolets that GM did required multiple vendors, multiple factories, and multiple assembly plants. Manufacturing reproduction auto parts starts with the best original part that’s available for a sample/pattern. Since there were no computers, and therefore no computer assisted design (CAD) in the ’50s, and multiple vendors for many parts, it is a challenge to find that perfect pattern part! As an example, the most recent die cast piece that we reproduced was the ’55-’56 Bel Air 3-spoke horn ring cap. In searching for a good pattern, we found 5 different original GM castings/casting numbers. They all fit a little differently. So, we chose the best fitting one for our sample, but admittedly on some cars that can be a slight compromise. Keep in mind that these parts can sometimes add that special character that makes us love these cars so much! 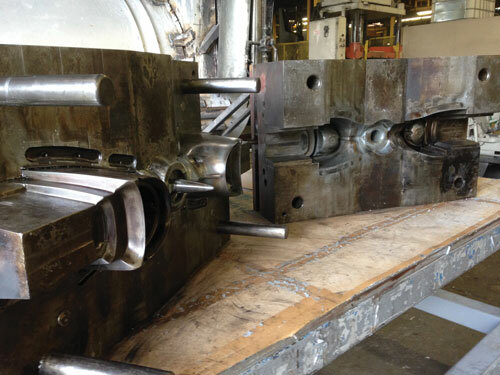 Once the right sample is found, tooling must be made. In the case of die cast parts, we use permanent tooling– American made, 4140 heat-treated H13 tool steel. It’s not an inexpensive process. Along the way there are multiple trial fittings to ensure an accurate reproduction part. 1957 Taillights rinsed after being removed from nickel plating racks, ready to be racked and chrome plated. 1957 Taillights on racks right after chrome plating. All of our parts are produced in very limited runs, typically 500 to 1000 pieces at a time. Our die cast parts are definitely done in this manner. 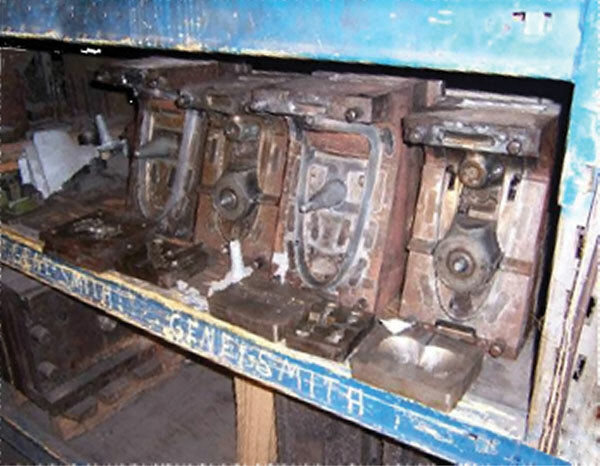 Die-casting is a very specialized business, and, just like GM did, we use outside die casters. 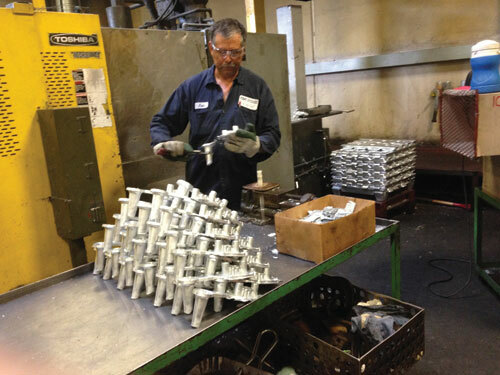 We utilize 3 different sources for our various parts; one in Los Angeles, one in Ontario, CA, and one in Illinois. Each one of these plants are expert in what they do. All of our parts are manufactured with hot-chamber zinc machines. The zinc is heated to 800F and injected into the two-part die under pressure. Too cold and the part will have what is called “chill” (which also happens if the tool is poorly designed), causing the zinc to cool too much as it fills the designed-in voids in the tool to make the part. Too hot and blisters occur. Each time the die is injected with 800F zinc (which is called a “shot”), it typically creates one part (a pair of ’57 taillights in this instance). 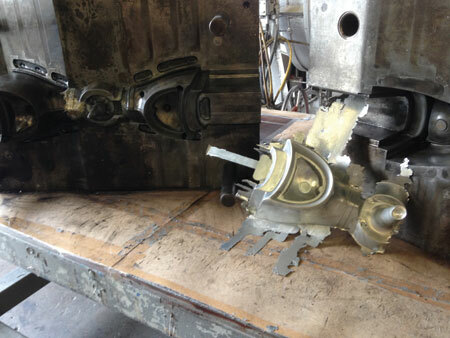 1955 Grille Moulding bars being removed from chrome plating tank. 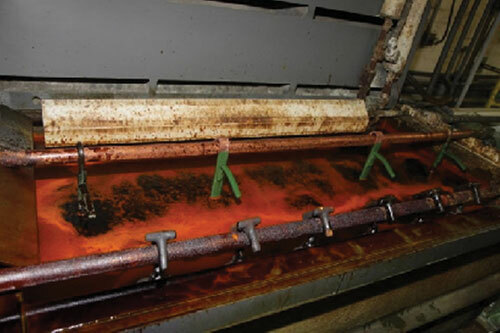 To start the process, several shots are run, and then dumped back into the pot (hence the term “pot metal”) with the molten zinc. This is done to get the molten metal and the tooling up to the correct temperature. Chill and/or blisters (porosity) are not always visible to the untrained eye. Sometimes they will show up in the polishing, but not always. They do however, show up once the part is plated. Like black paint on a car, chrome magnifies any imperfections. Some manufacturers use cold-chamber aluminum machines. There are some advantages, but the disadvantage is more porosity and chill. Porosity is the enemy of great chrome. After each shot, the tool is opened and the part is ejected, the tool closes and the process starts over, and then continues for several hundred shots/parts. 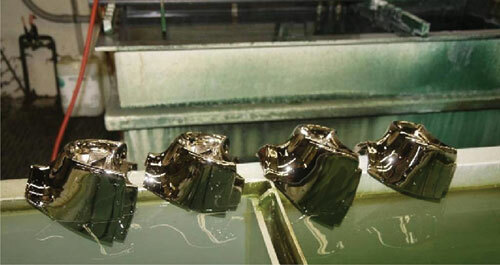 Raw castings have flash and overflow, which is excess zinc material. Often, this is razor thin (and razor sharp!). Flash and overflow is designed into the process, along with vents. The vents allow air and gases to escape, and the flash and overflow allow the tool to fill with good zinc, thereby avoiding tiny air pockets/porosity. So after the parts have cooled, secondary work is performed. The secondary work includes trimming of the flash, sometimes with a separate trim die. The part is then de-burred, and, on many of our parts, holes are tapped. Those 100s of raw parts are then delivered to us. Next step is polishing. The key to good plating is polishing and buffing (which is an art in itself) and involves a lot of handwork from polishers with 20, 30, 40, 50 or more years of experience! I am old enough to remember ’57 Chevys, new, on the showroom floor. My parents did a wonderful thing– in 1955, they bought a house 6 houses down from Potter Motor Chevrolet in Alhambra, CA, and that is where I really went to “school”– much to their chagrin! One of the polishers we use started polishing the year I was born. He knows his stuff. We don’t polish all those parts at once. This is done not for cost savings, but rather for quality. 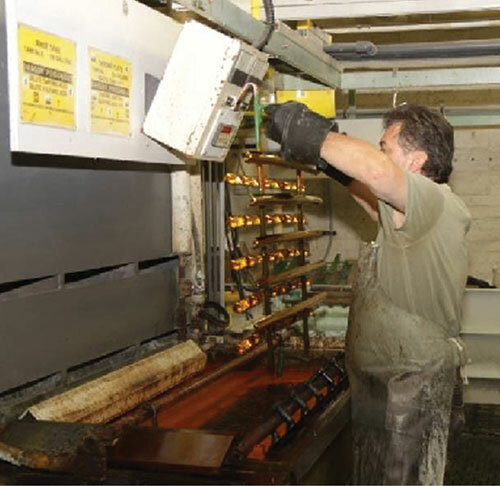 We want to ensure that the polisher is “fresh” and that the last part he does is as good as the first one. Again, it is an art. This also will also ensure “fresh” chrome for our customers. The parts that pass inspection are now ready for electroplating, so they get “racked”. 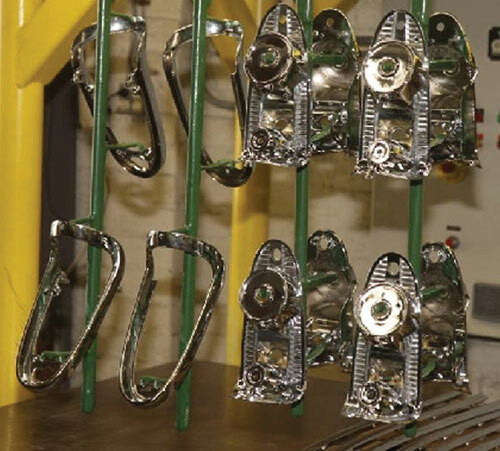 These racks are metal (in order to conduct electricity), and are designed to hold the parts securely as they are dipped in the various tanks for copper plating, then nickel plating, then chrome plating (along with tanks for rinsing and cleaning between each plating step). The part of the racks that do not make metal-to-metal contact with our part, or with the electrical conducting rod, are covered with a plastic coating (like plasti-coat) to appropriately direct all current, and properly direct the plating to the part. 1957 Taillight just after installing light socket, and final quality control check. 1956 Taillights on racks, coming out of dryer, after chrome plating. Chrome plating tank with parts being plated, left in the tank for several minutes. Notice how chrome tank looks like a vat of “chili”. Copper rod conducts electricity through the racks that are hung from it. Copper rod moves in an eccentric motion to agitate chemicals in tank for better mix and plating. Copper and nickel tanks appear basically clear. Our parts are of the finest quality on the market, but nonetheless we are always on the lookout to continually improve. As an example, 9 years ago we had our racks for ’57 taillights redesigned with an anode that directs the chrome deeper into the socket, all the way to where the bulb goes. While this cannot be seen after installation, it provides a better overall chrome plate of the part, and better light reflection behind the lenses. The racks are not what we make, but rather are another part of the art of plating. 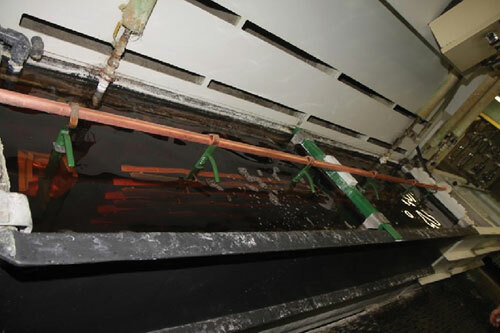 The tanks (as seen in the photos) contain the various chemicals and metals that go into plating. One tank has sacrificial brass, one has sacrificial copper “balls”, one has sacrificial nickel “pellets”, one has chrome and of course, there are various cleaners. The parts are lowered into the tanks and left in the tanks for several minutes with the current on. 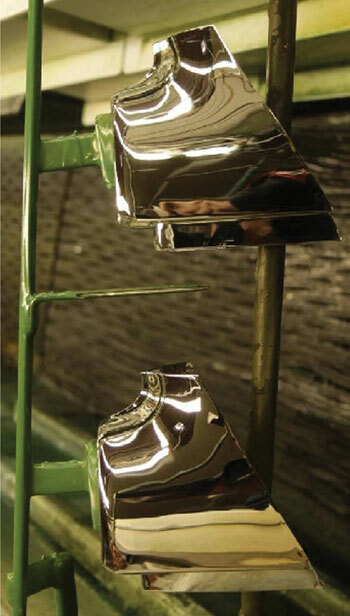 During this time, the chrome tank (chromic acid and lead anodes) is agitated to assist in a uniform mixture within the tank, and thereby a uniform coating on the part. The positively charged parts attract the negative metals in the tank, and with just the right racks, electric power, just the right chemicals, the right metal pellets, the correct time, etc., the part is uniformly coated with, in turn, copper, nickel and chrome. It is almost a symphony of chemicals, electricity, and various metals all coming together perfectly. 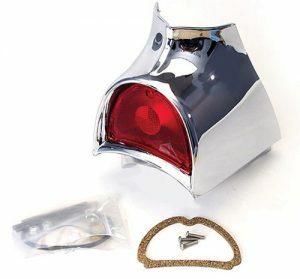 ’55 Grille Bars and ’57 Taillights soak in nickel tank. Nickel pellets are held in bags that are suspended in the back of the tank. Copper rod that racks are hanging from conducts electrical current for electroplating process. 1957 Taillight tool. Two halves are closed on pins to leave “void” for the parts. Each shot creates one pair, tool is opened and parts are ejected. ’57 Taillight as it comes out of the tool, prior to trimming of the flash and sprue. 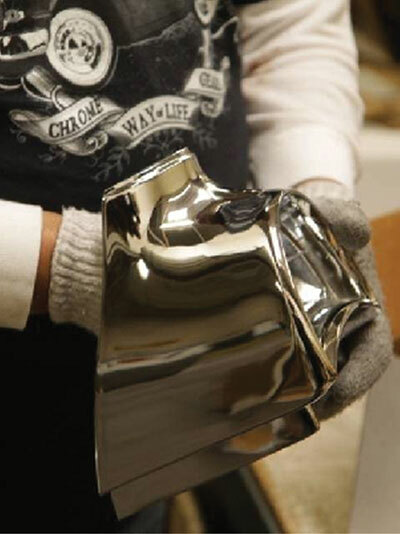 Chrome is a very thin and almost clear protective coating. What you see is actually the nickel, with a slight color change due to the protective clear layer of chrome. The chrome tank actually looks like a big vat of chili, with no beans! It is a coppery red colored liquid. People sometimes banter about the term “triple-plated”. There is no legal definition of triple-plated and it is not used in the industry. Auto parts typically (and all of our parts), are copper plated, then nickel plated, and finally chrome plated, which possibly leads to the use of the term “triple-plated”. All of our die cast parts are actually brass plated first, which acts like a primer for the copper. Of course, all along these various processes we have rejects. By design, this number is small, and 99% of it is scrapped. Almost 100% of our sales are of top quality parts. One or two pairs of taillights a year are sold as “seconds”. All the rest are either first quality or not something we want our name on. The finished parts are then delivered to us by our chrome plater. We chose to be located across the street from our long-time plater (established in 1946 in Alhambra, CA), so it’s an easy trip. In the case of our taillights, we then mechanically install the sockets. We use a two-step, 3-piece tool and die set, under pressure. We then use white cotton polisher’s gloves to do a final QA check and remove any fingerprints! No part leaves here with fingerprints on it. Rest assured, we’re not fugitives from justice, just quality-obsessed guys! The die cast machine (that is used for our taillights) being used at for other parts. The machine is closed for forming a part. At the far right of the machine is the pot full of molten zinc, with zinc ingots stacked in front. Our 1957 taillights are then inserted into the box with hardware, lenses, gaskets, bulbs, etc., labeled, and shipped.